New fine particulate matter monitoring equipment was progressively introduced across Canada to replace older monitoring equipment from the mid-2000’s to 2014. These new instruments measure a portion (semi-volatile) of the fine particulate matter mass not captured by the older instruments. Due to the differences between the new and the old monitoring equipment, concentrations measured with the new monitors may not be directly comparable with measurements from years in which older instruments were used. Source: CICH graphic created using data adapted from Environment and Climate Change Canada. 2016. Canadian Environmental Sustainability Indicators: Air Quality. https://www.ec.gc.ca/indicateurs-indicators/7DCC2250-A982-4286-B466-70681EBC994B/AirQuality_EN.pdf – accessed March 12th, 2017. This indicator was below the standard from 2008 to 2014. In 2014, the O3 peak indicator was 14% below the 2015 standard. 1Environment and Climate Change Canada. 2016. 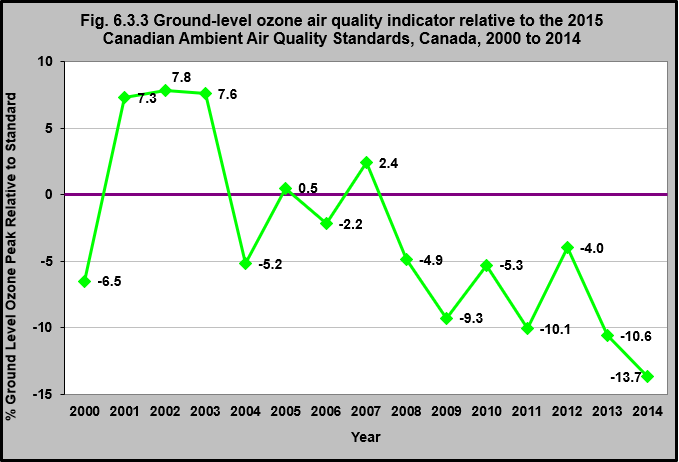 Canadian Environmental Sustainability Indicators: Air Quality. https://www.ec.gc.ca/indicateurs-indicators/7DCC2250-A982-4286-B466-70681EBC994B/AirQuality_EN.pdf – accessed March 12th, 2017.